This posting is a short one because I’m still recovering from a fall on Saturday while doing yard work at home. Argh! My Memorial Day weekend started out chaotically and soon got worse. Friday night Lynn and I went to the No Name bar in Sausalito, as we always do, to listen to jazz. I brought along a small roll of $2 bills so I could add a few to my tips, as I always do. Usually, the servers are happily surprised to get them. Midway through the evening, however, I reached into my coat pocket for the roll of bills, and it wasn’t there. I took off the coat, and Lynn and I searched all the pockets. Nothing. We were sitting in the garden area of the No Name, and people around us then joined in searching the ground. Nothing. One customer had an iPhone with a flashlight, and he let us use that to look under tables and chairs. Nothing. Chess players in the garden of Sausalito’s No Name bar. The server came out with her own iPhone flashlight, but still nothing was found. By now we had most of the customers who were sitting in the garden involved in the search, so I called it off and paid the tip from the usual cash in my wallet. The amount of money missing was relatively small, only $30, but it represented repeatedly dropping in at banks to see if they had any twos on hand. Usually they didn’t. In any case, I soon forgot about the loss, but when I got home and took off my coat, there were the bills in an obscure inside pocket. The coat as it turns out has 10 pockets, which is supposedly quite handy but is also enough to disrupt the back-garden customers at the No Name. A doe and her two fawns help clear grass downhill from Mitchell cabin. Saturday, I took advantage of sunny weather to weed-whack grass around the house. All was going well as I worked my way up a slope until I tripped and fell backward onto the ground. My rib-cage came down on top of the weed-whacker’s handlebar. Goddamn gravity! Lynn helped me get up, but when I went inside and tried to lie down, the pain became excruciating. Because it was a weekend, none of the clinics in town was open, and bouncing over the Coast Range to Kaiser Hospital in Terra Linda was not an option. The next day was Sunday, so there still were no clinics open. The day after that was Memorial Day, and the clinics were still closed. Finally today, Tuesday, Lynn drove me, sightly sedated, to Kaiser in San Rafael where a doctor concluded I had bruised a few ribs but not broken any. So now I’m back home again, getting a jab in my side every time I cough or roll over in bed. Getting in and out of bed is pure torture. However, I’m expected to recover. Marin Agricultural Land Trust held its annual art show in Nicasio’s Druid Hall this past weekend. What a crowd! The landscapes on display were reminders of the beauty and tranquility now being protected forever by MALT conservation easements. The popular art show is one of MALT’s sources of income, and local artists share part of the selling price to take part. For MALT’s explanation of what it does, click here. Nicasio Druid Hall was packed with folks checking out the 18th annual Ranches and Rolling Hills Landscape Art Show and Sale. Wood sculptor Bruce Mitchell with three of his impressive works made from eucalyptus: Fossil Fish No. 1 (middle), No. 3 (on top), and No. 4 (on the bottom). Fossil Fish No. 2 was across the room on a different wall. Nicasio artist Thomas Wood lives on the town square only a few doors from the Druid Hall where these paintings by him were on display. A guest talks with artist Robert Steele. This was his second year to be admitted in the selective show. This was artist Ane Carla Rovetta’s 17th MALT show. She lived in Point Reyes Station for 27 years, she said, until the cost of housing convinced her to get a small home in Petaluma. Miriam and Mark Pasternak of Devil’s Gulch Ranch in Nicasio sold packages of ground coffee. 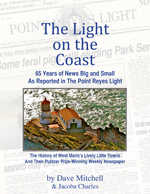 The Light on the Coast: 65 Years of News Big and Small as Reported in The Point Reyes Light, has now sold out virtually all of its third printing. When I wrote the book a year and a half ago with Jacoba Charles as coauthor, I had no idea it would sell so well. Aside from a very few copies at Point Reyes Books, Toby’s Feed Barn, and Tomales Regional History Center, it’s no longer available in West Marin. The History Center published it, and on Sunday Lynn and I drove to Tomales to drop off the last few copies still on hand. It would have been an easy jaunt were it not for all the bicyclists on Highway 1. Riding four abreast on a two-lane state highway would seem to be the height of either ignorance or arrogance, but at least on this trip we didn’t see any spandex-covered legs sticking out of the ditch. While in Tomales, Lynn and I stopped at Mostly Natives Nursery to check out the posies, and Lynn found a giant verbena to add to the foliage on our deck. For those of you who aren’t familiar with it, Mostly Natives is a great little nursery right beside Highway 1 downtown. And as it happens, it’s also the setting of one of my favorite stories in The Light on the Coast. In a March 3, 2005, news article headlined “Wild turkey blacks out Tomales,” Point Reyes Light reporter Peter Jamison wrote: “A surprisingly resilient wild turkey downed power lines in Tomales last week, causing a four-hour blackout. The turkey, by all indications, is still alive and at large. “Tomales residents Margaret Graham and Walter Earle, owners of Mostly Natives, were drinking tea and reading the paper shortly before 6:45 a.m. last Friday in their home when they were startled by a loud explosion and brilliant flash of light from outside their window. “Running outside, they discovered three downed power lines and a dazed-looking turkey walking in circles on Highway 1. The couple watched as the turkey ambled into the field across the road from their house, disappearing into the brush. “Earle immediately reported the downed power lines to the Tomales firehouse. ‘Some turkey just took out the power lines,’ he recalled saying. Fire Captain Tom Nunes told The Light that he assumed at the time that Earle was referring to a drunk driver rather than a bird. “Arriving on the scene, Nunes and a crew of volunteer firefighters were baffled to find a mysterious scattering of feathers, but no turkey. After a search of the area yielded no dead or dying birds, Nunes could only confirm that the turkey had somehow survived a head-on collision with a 12,000-volt power line. “The jolt of electricity administered to other birds — such as turkey vultures — that more commonly touch live power lines is so strong that the birds typically burst into flames, Nunes said. Typically this occurs when a vulture sitting on a line starts to take off, and its long wings touch two lines simultaneously. In one such accident in the summer of 1998, a flaming buzzard fell to the ground and ignited a 2.5-acre grass fire along Old Rancheria Road in Nicasio. “Some 825 households and businesses in Tomales initially lost power when the blackout began at 6:45 a.m. Of these, 622 had their power back on by 8 a.m. All customers had their lights back on by 10:15 a.m., spokesman Lloyd Coker of PG&E said. “Coker noted that he’s never heard of a bird surviving a brush with power lines, and he could recall only one instance when a wild turkey had flown into a power line, which happened about eight years ago in Sebastopol. “‘I certainly wouldn’t say it’s a common occurrence,’ he added. The scarcity of such incidents is no surprise since wild turkeys can fly only short distances when they fly at all. ‘They don’t fly all that well, so we’ve had no [previous] cases of turkeys hitting the power lines,’ Nunes said. “At the site of last week’s mishap, however, a steep hillside serves as a launching pad for the birds, which — frantically flapping their wings — can travel to the field across the road. This excerpt from Jamison’s news story is one example of why I as editor of The Light appreciated his craftsmanship. Nor was I the only editor who did. After he left The Light, Jamison went on to write for SF Weekly, The Tampa Bay Times, and now The Los Angeles Times, where he is the metro reporter. Meanwhile, back in Tomales, nurseryman Walter Earle today shared his amused memories of that winter day 10 years ago when a wild turkey blacked out the town. In particular, he remembered firefighters preparing for a medical emergency when they thought the “turkey” he was talking about was a drunk driver. About 150 people showed up Sunday at Tomales Bay Resort and Marina for a Community Farewell to former West Marin Citizen publisher Linda Petersen of Inverness. Petersen on Saturday sold her paper to Point Reyes Light editor Tess Elliott and her partner David Briggs. The Citizen will now cease publication, and The Light should be more financially sustainable as the only newspaper for a readership area of about 10,000 people. As one speaker at the party noted, the creation of The Citizen in 2007 grew out of community resentment toward sensationalism in The Light while it was published by Robert Plotkin of Bolinas from 2005 to 2010. The advent of a competitor created financial problems for The Light, Plotkin acknowledged in 2010, but The Citizen itself wasn’t highly profitable. With Tomales Bay and the resort’s marina in the background, the artist Vickisa of Bolinas makes mental notes as corn cobs are barbecued on the deck of the resort. The Citizen’s former obituary writer Larken Bradley (left) and her husband Mark chat with Linda Petersen, who will soon move to Portland to be near her son and daughter and their families. Unable to attend the event was my partner Lynn Axelrod, who started The Citizen’s calendar section and who for three years was the paper’s only regular reporter. As a reporter, she often did the work of a news editor — finding many of the news stories she covered. In this role, she received compliments and thanks from readers. Former oyster-grower Kevin Lunny (left), whose family plans to open an oyster bistro at the resort, chats with Ulla McLean of Point Reyes Station (center) and Joyce Goldfield of Inverness Park. Joel Hack of Bodega Bay founded The West Marin Citizen in June 2007 under the name West Marin Pilot. When the paper began publishing weekly the following month, the name was changed to West Marin Citizen. Here Hack enjoys slurping down an oyster on the half shell. George Clyde of Marshall (left), a former programmer at KWMR radio, swaps stories with historian Dewey Livingston of Inverness. As Petersen prepares to move from Inverness to Portland, Bernie Stephan, the master of ceremonies, takes note of the many places she’s lived, including Denmark, Sweden, Hawaii, and Puerto Rico. Kris Brown, who is active in progressive politics locally, tells of how much she enjoyed working with Petersen. Stinson Beach gallery owner Claudia Chapline, who has been writing art reviews for The Citizen, has let it be known she will now write them for The Light. Joel Hack, who founded The Citizen eight years ago, previously published The Bodega Bay Navigator. He turned The Citizen over to Petersen, who was then his ad manager, three and a half years ago. The Haggards with Colin Schlitt, Van Van der Maaten, Danny Vitali (standing left to right) weren’t the only local performers well received by the audience. Performing later in the evening was the band El Radio Fantastique, who got everyone dancing — including small children and band member Loyal Tarbot’s 92-year-old grandmother. As is common at community events hereabouts, Art Rogers of Point Reyes Station had the guests pose for group photo. Standing left of Petersen, who has just received a bouquet, is Tess Elliott, editor of The Light, and her partner David Briggs. Seated at far right is Mary Olsen who with Teri Mattson hosted the farewell party. Sparsely Sage and Timely is powered by	WordPress 4.9.10 and delivered to you in 0.772 seconds using 48 queries.